At some point in your traveling life, you’re going to have to dive into the complicated world of rental cars, whether you’re heading out on an epic road trip, staying somewhere medium-term for work, attending a business conference, or simply getting out of the city for a long weekend. It’s a world where a lot of research and deal-scouting is required to get the best rate — and ensure that you and your rental are protected while on the road. The U.S. offers quite a few companies to choose from, although many are owned by the same parent corporation (Enterprise, Alamo, and National Car Rental are all sister companies, for example). We’ve rounded up the best companies to get your rental car from, whether you’re hitting the road for business or pleasure — or looking to treat yourself by taking an exotic car out for a spin (some companies offer a surprising selection of luxury cars). Scroll through for some of the best rental car companies for service and value to help make your search a much easier one. National Car Rental, a sister company of Alamo and Enterprise, excels when it comes to customer service, taking the No. 2 spot in J.D. Powers’ annual report—and taking a five-star score for both overall satisfaction and its reservation process among customers. It has a huge variety of vehicles to rent, from little compact cars to Chevy cargo vans. National’s offerings and programs are aimed especially at business travelers, with companies taking advantage of the company’s business rental program, which lets employees at any sized company get cars at contracted rates versus having to pay a premium for rental needs that pop up at the last minute during busy travel times. Renters can also put their air miles toward renting cars with points from a number of common programs—Delta SkyMiles, American Airlines AAdvantage, and Southwest Rapid Rewards—as well as points from hotel programs like Hilton Honors. Overall, it’s a solid bet if you want an easy way to book cars at a fairly standard rate. Alamo might not brag about being wallet-friendly, but even without an emphasis on thrift, the company’s cars run about $42 a day, which is around seven percent less than the average industry per-day price, according to Time. It’s a favorite with millennials, offers unlimited free mileage as standard, and if you happen to be hitting the open road with a significant other or a group, the cost for a second driver is less than a lot of the competition. We also love the Alamo Insider free program that gives customers a guaranteed discount of five percent off the retail rate. They support teachers, with National Education Association members getting an extra day free when you rent for five days or more. 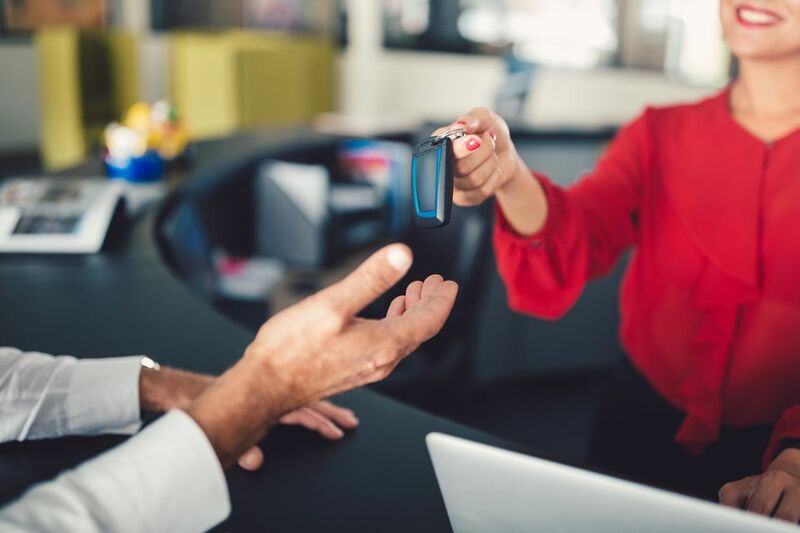 Of course, no one loves returning a rental car—depending on the provider, customer service can be a huge sticking point at this point in the rental process. However, Alamo customers say this is one area where the company excels. Although it’s one of the largest car rental companies there—it has more than 1,600 airport locations in the U.S. alone—it’s definitely not the cheapest, with an average daily rate of $48.50, putting it on par with Enterprise. We love the range of cars that the company offers: While there’s definitely your business-trip standards, as well as high-capacity cars for families and compact economy cars for those on a budget, there’s also a rental section of hybrid cars, luxury “dream cars” that are treats for memorable trips, and a special-edition Mustang Hertz collaborated with Ford to create. The company also offers a great “NeverLost” GPS program, and it doesn’t come with just a device: You’ll also get access to an online trip planner, which you can then download your route to your GPS via a flash drive, a concierge service for planning assistance, and clever features like downloadable national park and city guides. Avis, by far, is the most expensive rental company out there, with daily rates averaging out to be around $60 per day. However, there’s a good chance you might be able to knock the price down a bit, with plenty of discount codes, rebates, and promotions available to savvy customers who aren’t afraid to put in a bit of research work (AARP members also get special rates by default). If you’re renting in the Northeast, all cars come with e-Toll, so you don’t have to think about extra toll costs. It’s also good for companies whose employees need to snag a car for a bit—small businesses, in particular, can get up to 30 percent off their rentals. Although customers rate the company’s service really well, one thing we love is the fact that there’s a dedicated app to directly manage your reservation from booking to drop-off, which takes the hassle out of fighting your way through a phone tree when you’re supposed to be enjoying your vacation. Budget, true to its name, has some of the cheapest car rentals in the industry, with an average rental cost of about $35/day—and an extra discount—up to a whopping 35 percent—if you pay when you make the reservation. They also do Mustang weekend program where you can get a free third day—although it’s for intermediate (group C) through four-door full-size cars (group E) only, it’s still an offer that’s attractive for families hitting the road for a quick weekend trip. If you want something that’s not your usual rental car, Budget’s got that too—it’s not just Honda Accords here: You can rent hybrids like the Toyota Prius or convertibles like a Chevy Camaro here, too. Just be advised that customer satisfaction is a little lacking, starting with the reservation process and ending with the drop-off, so if customer service is something that will make or break an experience for you, it might be worth paying a bit more elsewhere. Dollar for dollar, pardon the pun, this rental company is one of the cheapest in the industry, with rates at about $30 a day (and a further 15 percent off discount on base rates if you sign up for their newsletter). If you’re just focused on getting the most for your money, this is the rental company for you, but don’t go into your rental looking for top-quality customer service or an easy return process. It offers a full fleet, from basic economy cars to pick-ups and vans that can be a lifesaver on family trips or on moving days. However, the company is good for customers enrolled in rewards programs, with offers like quadruple American Airlines points when you rent a compact car for more than three days. It also has its own rental program that offers business travelers who rent frequently some serious perks, faster booking and shorter lines among them. Like Budget and Dollar, this company is all about the bottom line for its customers; however—let’s just get this out of the way—customer satisfaction just isn’t what it is at higher-tier companies like Enterprise and Avis (though it’s owned by Hertz). That being said, although it offers some of the lowest prices in the industry, it also offers a few cool perks: We love the online check-in system they over, where you just input your name and booking information before heading to the pick-up office, and it’s just as cheap as other budget-minded rental places (it and Dollar, for example, are sister companies). Keep an eye out for location-specific offers too, especially for weekend rates. There’s also plenty of locations, with almost 500 pick-up and drop-off sites in the U.S. and Canada. However, customer service isn’t the greatest here—don’t expect them to roll out the red carpet when you’re returning your car.